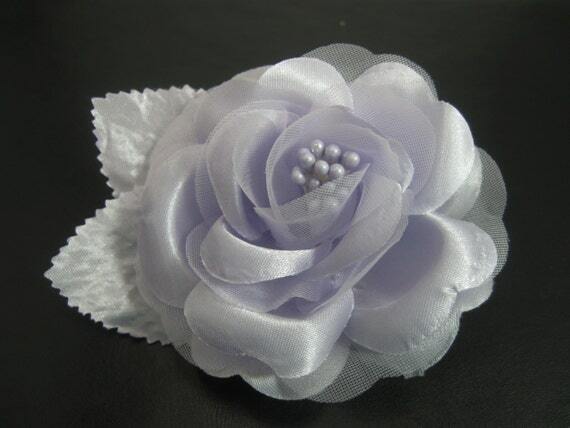 This lavender rose flower clip is very feminine and pretty. It measures 3" wide and is attached to an alligator clip. 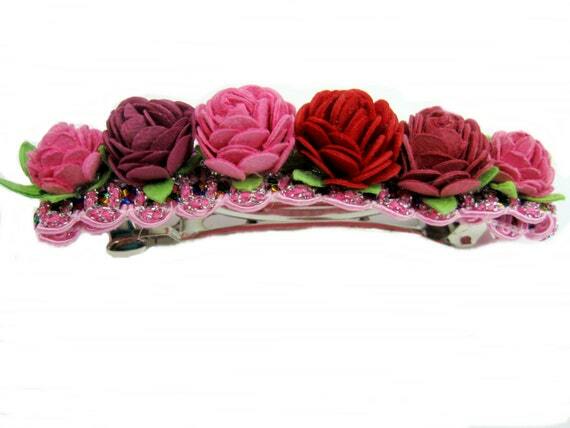 The no slip grip added to the clip is sure to keep this beautiful rose secure in your hair. Perfect for everyday wear or special occasions. 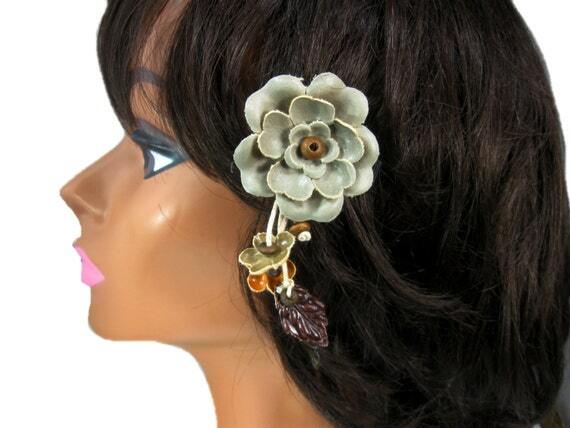 Flower hair barrette for girls, teen and women. 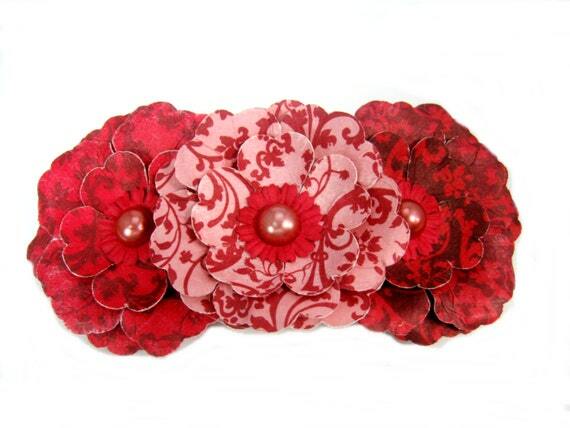 French hair clip is 3 inches and is decorated with 6 small flowers varying in shades of pink and red. Great for weddings, prom, parties and other special occasions. Listing including set of two hair clips. 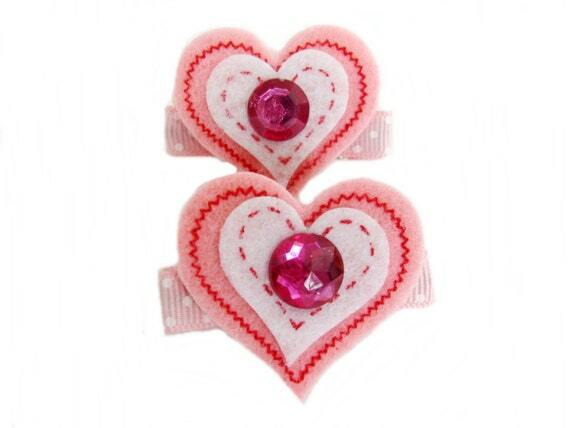 Valentine hair clips are made with red and pink felt and a small pink ribbon rose decorating the center. Hair clip set is great for baby, toddlers, girls and adults. 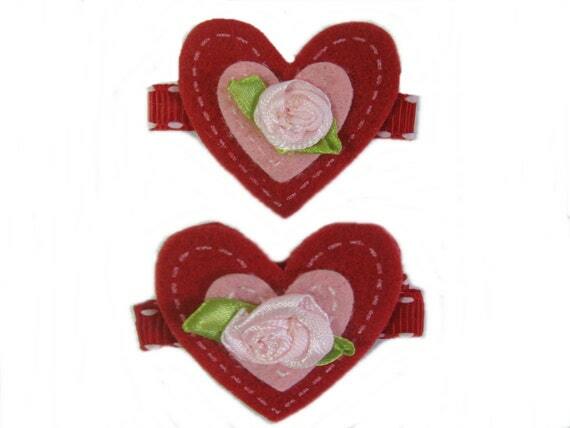 Set of two Valentine hair clips for all ages. Pink and white felt heart are mounted on partially lined alligator clips with no slip grip. Cute hair accessories for the holiday and can be worn all year long. Adorable set of nine baby hair bow clip for a little princess. Hair bows are 2 inches and are attached to small snap clips measuring 1 1/4 inches. Great collection to mix and match with different outfits during the year. 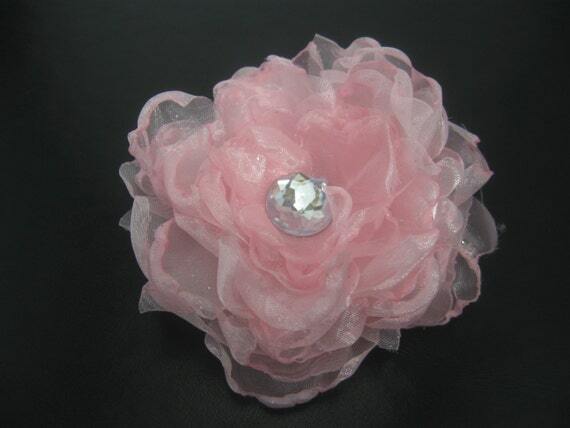 Pink floral hair clip made with a light pink organza fabric measures 3 inches across. This handmade flower clip is just right for your sweet little girl and a wonderful wear for parties and other special occasions. 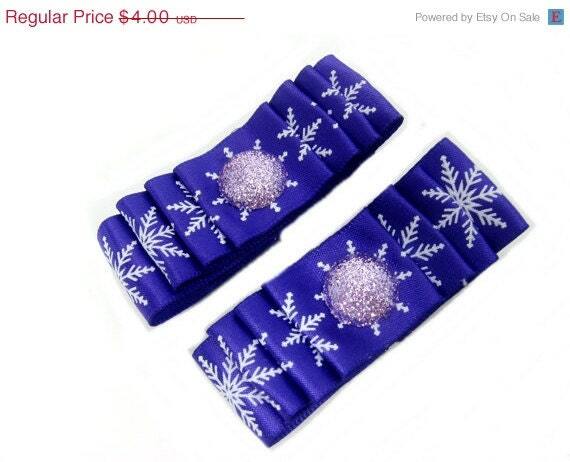 Purple tuxedo bow hair clip with snowflake measures 2 1/2 inches. 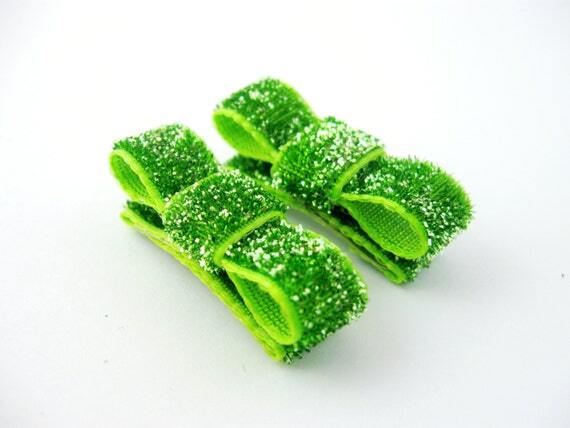 Alligator clip is partially lined with all ribbon ends treated to prevent fraying. A shimmery light purple cabochon decorates the center. A very cute hair accessory that can be worn by all. Glitter green tuxedo hair bow for babies and toddlers. Bows are attached to mini snap clips measuring 1 1/4" which are partially lined with matching green glitter ribbons. 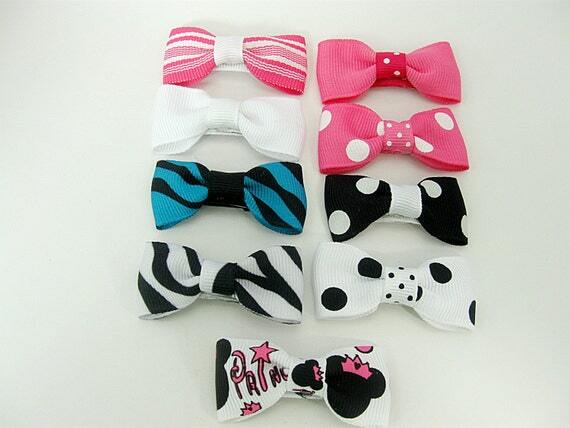 These small bows are great for kids with very thin hair. 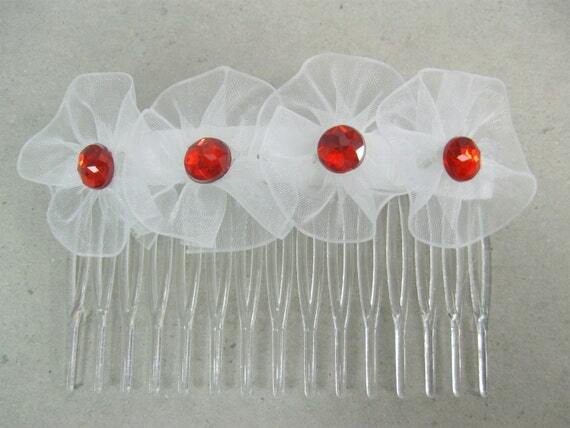 Hair comb with sheer ribbon flowers and red rhinestones. This handmade hair accessory featuring a plastic hair comb and flowers is 3 1/4" wide. Only the flowers will show when place in the hair. Great for girls and teens. This is a fun and wonderful hair clip for girls during the Christmas holidays. 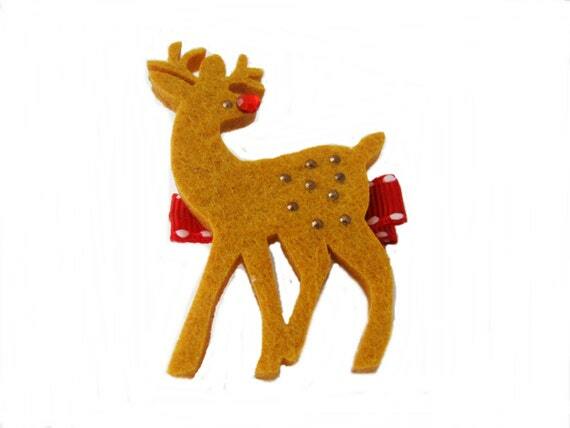 Featuring Rudolph the red nose reindeer hair clip. Attached to an alligator clip with no slip grip making it easier for anyone with fine hair to wear this hair accessory without fear of it falling out of hair. This flower clip is the perfect hair accessory to wear during the Christmas holidays. Red flower is attached to a 3" barrette. The total length of the flower is 5" wide. This Christmas hair clip is great for girls, teens and adults. Set of two green and red flower hair clips. 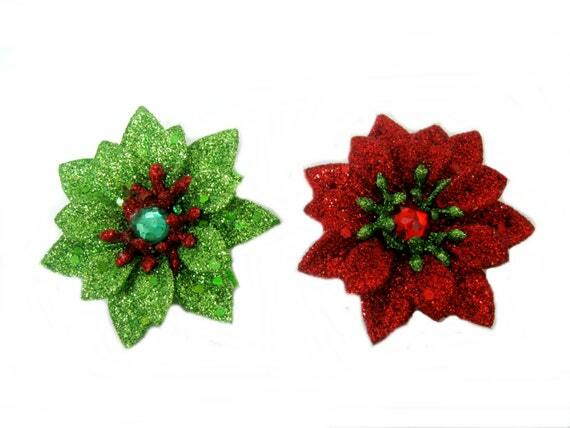 Poinsettia flowers are approximately 2 inches across and are mounted on partially lined alligator clips. Flowers are glittery with a rhinestone in the center. Great hair accessory for the holidays or a Christmas gift. Handcrafted multicolored hair barrette measuring 3 inches in length. Great hair clip for all hair types. Use this barrette to hold your beautiful locks in place. 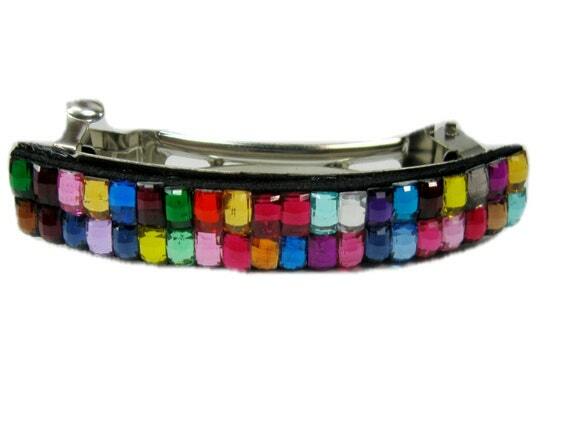 This colorful design will go well with any outfit and makes a wonderful impression. Flower hair clip with dangles measure approximately 3 1/2" x 1 3/4". It is mounted on a single prong alligator hair clip. Alligator clip is partially lined with ribbon with no slip grip. Great hair accessory for teen girls and women of all ages. 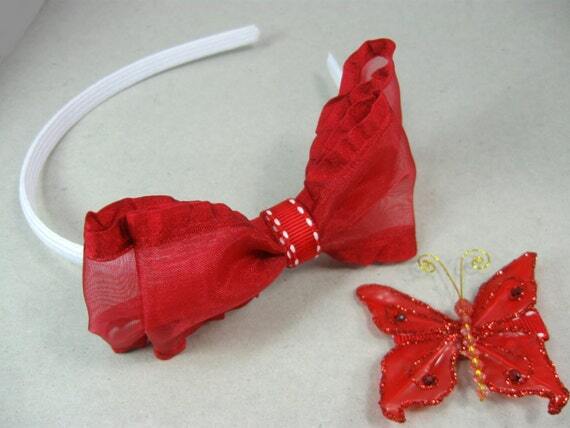 Red hair bow headband and butterfly hair clip make a great Christmas gift for girls. Hair bow measures approximately 5" wide and is attached to a white headband. The red butterfly is 2 1/2" wide and is completed with a partially lined alligator clip with non slip grip.